Actor/comedian Ray Romano hits his opening drive in the Cox Celebrity Championship at Morgan Run Resort and Cub in Rancho Santa Fe. Ray Romano is two swings into his round Saturday in the Cox Celebrity Championship at Morgan Run and everyone can see he is already having swing thoughts. 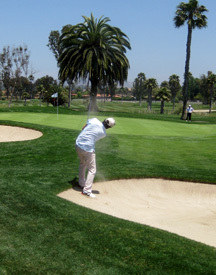 Ray Romano blasts out of a sandtrap on the first hole at Morgan Run. Romano obliges, then heads to the sandtrap. After sizing up his shot, Romano swings and gets too much of the ball, knocking it well over the green. “Kid probably wants to give me the autograph back now,” cracks Romano, who needed several more strokes to finish the first hole. Fans expect to see spectacular shots from players such as first-round leader Mark Mulder. The former pitcher shot a 4-under 67, two shots better than former outfielder Vince Coleman. NFL Hall of Fame running back Marshall Faulk and Dallas Cowboys quarterback Tony Romo were another shot back at 70 entering Sunday morning’s final round. Romano? He fared better after carding the triple bogey 8 on the first hole, but still was well behind the leaders with an 88. Unlike the others, the pressure on Romano isn’t to impress the gallery with his shot-making but his wise-cracking. Golf is a difficult enough game without being interrupted between shots to sign autographs and pose for pictures, but Romano is more accommodating than most because he knows it’s what fans are expecting at these charity events. It does put added pressure on his play, however. Romano was quick with a quip when a shot went awry — entertaining the one- to two-dozen fans who followed him throughout his round — but he is serious about his golf. 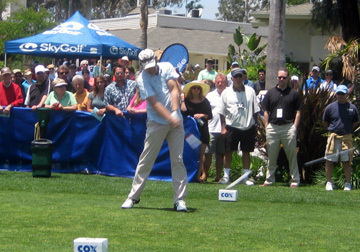 In fact, last year at this event Romano was working with swing coach Hank Haney to improve his game. Romano’s goal is to break 80 for the first time in his life. A three-foot putt on the 18th hole was all that stood between Romano and a 79 at Morgan Run a couple of years ago. “And I missed it,” said Romano, who has been so busy with work that he hasn’t had many opportunities the past year to pursue his goal. So it will be left for art to imitate life. Romano stars now on the show “Men of a Certain Age,” where he plays Joe, a party store owner with aspirations of playing golf on the Senior Tour. We’ll find out how things go for Joe beginning June 1 when the TNT series resumes new episodes.